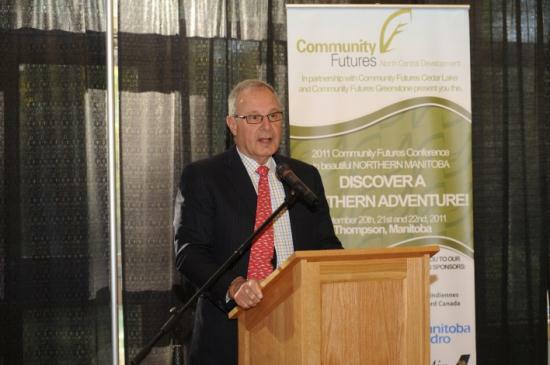 Community Futures North Central Development (CFNCD) was established in 1996 and is a community economic development corporation that serves the north central region of Manitoba. CFNCD is federally funded through the Department of Western Economic Diversification. While financial support comes from the federal government, control and operation of the organization rests with a board of directors comprised of 17 volunteers, who are appointed by local government. CFNCD represents 17 communities including First Nation (7), Northern Affairs (7), and Urban Industrial (3). At present there are 9 staff that work in the CFNCD office, located at 3 Station Road, Thompson, MB. The Community Futures program was established to assist northern communities in small business start up, expansion and acquisition. The program also has a focus on community development and partnering with other agencies and has been involved in projects such as, Childcare, Housing, Rail Service Delivery Liaison, Skateboard Park, Spirit Way, Thompson Newcomer Settlement Services, Tourism North and Youth, to name a few .